The mix itself is mostly a random collection of recent music I’d bought, and was one of the few times I’ve just thrown a recorded mix together like this — usually I come up with a theme beforehand or record a live DJ set somewhere — so it seemed appropriate to have a cover that was somehow randomly generated. The above animation is a sequence of random ellipses, slightly offset by a small random amount from the centre of the sketch, drawing atop of each other, while slowly erasing the previous the ellipses; it was attempt to recreate the effect of this album cover that I discovered while previewing some new tunes, solely has an exercise of interest. In this review, I’ve realized how closely my mix cover resembles the original cover art inspiration, but I’d like to think that I arrived there in a roundabout way, as opposed to literally copying it. This is something I love about Processing: starting out w/ an initial idea and then plugging away with various revisions and tweaks on a theme; simply experimenting to come up w/ something appealing or interesting . 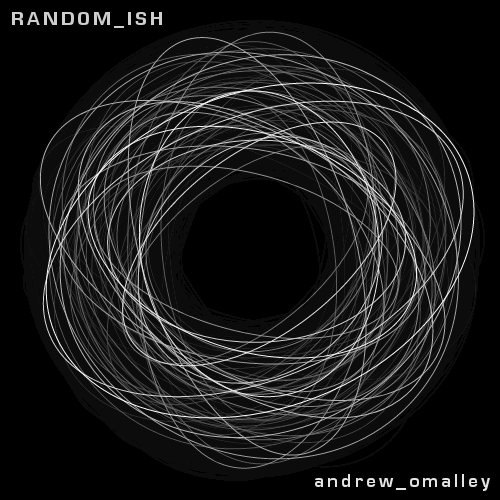 . .
I’ll certainly be using Processing to generate more cover art in the future. And if you haven’t already, please enjoy the mix!